As reports of a bust-up with one of his star player emerges, Arsenal boss, Unai Emery, has finally reacted to the rumours, saying that they have a good relationship. 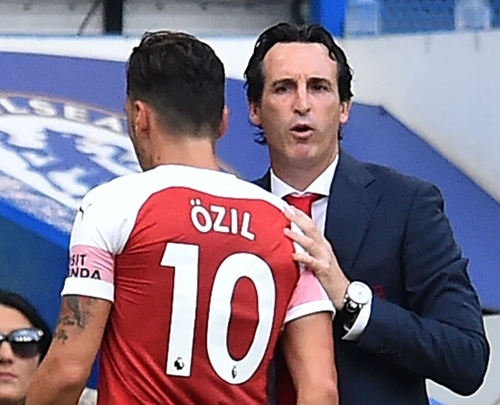 Arsenal coach, Unai Emery, has insisted that he has a “good relationship” with Mesut Ozil, contrary to reports of a bust-up between the Arsenal pair, Skysports reports. Emery said he enjoyed a “relaxing” three days with Ozil in training after the player’s retirement from international football meant he did not depart with the Germany squad last week. Ozil was omitted from Arsenal’s squad for last month’s 3-1 win over West Ham, prompting reports of a dispute with Emery – who had said the midfielder was ill – before he returned to the starting XI for the last game at Cardiff. Speaking ahead of Arsenal’s game against Newcastle this weekend, Emery said: “[We get on] very well. Here for me it isn’t for a lot of the time speaking about what people are telling us. Ozil’s retirement from international football came after he made claims of racism from the German football association. Emery admitted Ozil’s first international break since his retirement will have been a difficult adjustment for the player, but that the pair have been able to spend beneficial time on the training ground together. “The first time, maybe, he could feel different but every day with us in the work, I look at him and he looks well and happy, working with our demands every day,” said Emery.